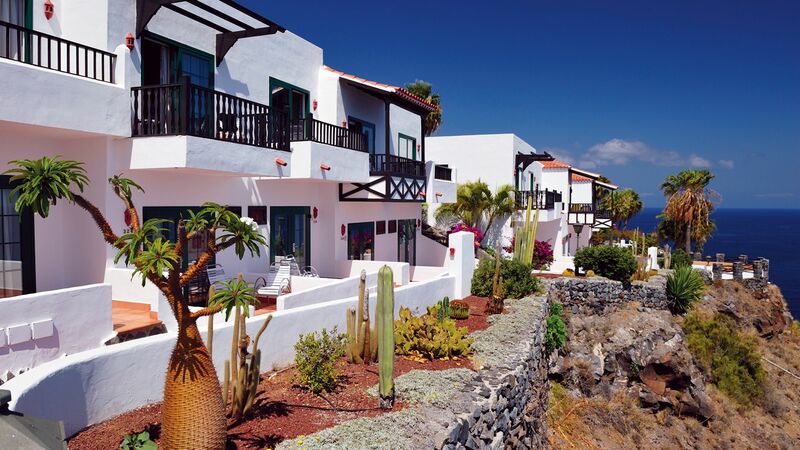 Holidays in La Gomera bring you the quieter side of the Canary Islands. This little island is the perfect way to see the beauty and unspoilt, rugged coastlines of Spain’s Canaries. Traditional villages are peppered along the coastline, with large golden sandy beaches backed by lively restaurants and pretty little coves where you can enjoy having the place to yourself. Explorers will find plenty to enjoy in La Gomera. Its interiors are filled with forests and mountains where you can hike, mountain bike, or horse ride, and take in the striking views of the coastline. Along the coast you’ll find fishing villages, which date back to the 15th Century, as well as local restaurants serving authentic dishes and more. Playa de Santiago is ideal for golf and nature lovers alike. Its whitewashed buildings are picture perfect and overlook the sparkling ocean and its black sweeping beach. Choose luxury holidays in La Gomera and experience the quieter side of the Canaries, with unspoilt landscapes and pretty little villages. Couples will love the chance to immerse themselves in a laid back culture or simply get away from it all and spend days relaxing on the beach, by the pool or in the spa. Explorers can experience a wilder side of the island, with nature trails, woods, forests, and mountains, as well as pretty harbours where you can set sail through the glistening waters of the sea. If you want to enjoy delicious cuisine and Spanish tapas at its best, there is a host of local restaurants in most of the larger resorts. Book your luxury holidays in La Gomera and we’ll help you experience this wonderful island at its best. We provide private transfers and selected airport lounges, as well as finding you the right hotel, to ensure everything is taken care of. Stay at the Hotel Jardin Tecina for its fantastic views, whitewashed architecture, and intimate feel. La Gomera offered much more than I was expecting. The island’s landscape is beautiful, with lots of greenery and forests of banana trees. It’s a great place to drive; roller-coaster roads thread through the valleys and tunnels have been cut through the hills. La Gomera is perfect for walking and the island is covered in footpaths, especially in the Garajonay National Park. Listen out for the whistles - Silbo is a 16th-century whistled language which was used to communicate across ravines, and is still taught on the island. Playa de Santiago is a tiny south coast fishing town. It’s the setting that counts here – it’s right next to a dove-grey beach and ocean-view golf course. The UNESCO-listed Garajonay National Park is in the heart of La Gomera. It’s around 40 square kilometres of dramatic rock formations, fern-brushed waterfalls and streams, old subtropical rainforest and bald-headed rocky peaks. Shaded footpaths wind through rare laurel forests that often come with a veil of wispy fog, thanks to the higher humidity. It’s a real gem for keen walkers and bird watchers, who can keep an eye out for the rare white-tailed laurel pigeons that nest in the evergreen trees. La Gomera is something of a hiker’s paradise. Its unspoilt coast, mountainous landscapes and thick laurel forests are covered in walking trails, plus you’ll find wide-angle views across to the surrounding Canary Islands. Garajonay National Park is one of the must-dos. For something a little different, try the slope-side villages of the Imada Valley or the steep-sided Palm Valley. Not sure about going it alone? Hop on a guided tour from Playa de Santiago. The historic port town of San Sebastian is the capital of La Gomera. It’s home to shady piazzas and walkable streets decorated with bright lemon, lime and strawberry houses. A small but lively promenade is a good place to stop for a seafood supper. It’s close to a couple of quiet sandy beaches and a red-striped lighthouse with views straight over to Tenerife’s Mount Teide – the tallest mountain in Spain. Fancy heading over there? Hop on a ferry from Marina la Gomera in San Sebastian to Los Cristianos on the south-west coast of Tenerife. Canarian cuisine is classically Spanish, following the Mediterranean obsession with fresh fish, olive oil and seasonal vegetables. Being a little island, food in La Gomera is all about being local, fresh and seasonal. Seafood is naturally a big deal, including tuna (go for grilled steaks) and parrotfish (vieja). Typical dishes in La Gomera are simply, hearty and delicious. Stews are popular, with fish or rustic meat like chicken, rabbit and goat. Flight time from the UK to Tenerife is around 4 hours 30 minutes. From here, it's a 40-minute ferry crossing to La Gomera. Like the rest of the Canaries, La Gomera is a year-round beach destination. Temperatures rarely dip below the late teens, even in winter. April and May starts heating up for summer, which reaches its peak in July and August – often in the 30s.